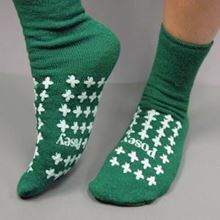 Our Standard Posey Non-Skid Socks come in a variety of colours, which means identifying fall risk patients has never been quicker or easier. They are easily incorporated into any Fall Management/ Prevention protocol you have in place to help reduce the risk of fall related injuries. .
Standard size fitting for day or night time wear (fits most patients). Socks are easily incorporated into any Fall Management/ Prevention protocol you have in place. 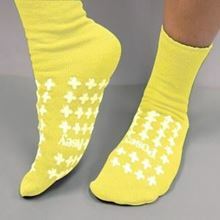 Grip on top and bottom offering double protection even if the sock become twisted while in bed. Available in five colours: Allows a colour coding system to raise awareness of high fall risk residents. Soft terry-cloth which is latex free, comfortable and warm for patient wear. All colours are also available in the size Large and yellow is available in the Paediatric/ Small size.